Approximately 200 kilometres north of Cape Town, in the fertile Western Cape Province, the rugged Cederberg Mountain range surrounds a plateau. Further north of the town Ceres, named after the Roman Goddess of Fruitfulness for good reason, at 1050 metres above sea level, lies the Koue Bokkeveld. A literal translation from the Afrikaans language, Koue Bokkeveld means “Cold Buck Shrubland” and as the name suggests, the winter months are especially cold. It was so cold that the original settlers had to be paid special subsidies to settle in the area. The summers are short, dry and hot, but with rivers and dams providing fresh mountain water, the scene was set to grow some of the world’s finest fruit and vegetables. This is where the forefather of one of South Africa’s leading fruit and vegetable growers, Dutoit Agri, established the basis for which was to become one of the country’s largest agricultural businesses. 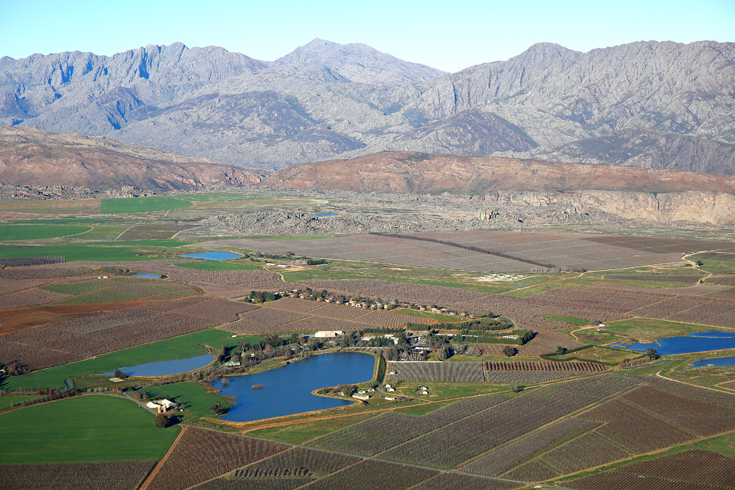 Gysbertus du Toit (I) settled on Kromfontein Farm more than 120 years ago. An imposing man, who, if around today, would have smiled at what subsequent generations have achieved. Central Packing facilities built in Ceres. Centralisation of support functions such as technical, admin, finance and human resources. Jan-Linde du Toit awarded with the OHS Reinecke industry leader award by The Deciduous Fruit Industry and ARC Infruitec-Nietvoorbij.